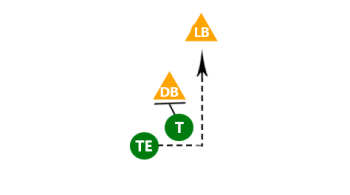 Often called a power block, the purpose of this offensive line drill is to learn good movement and chipping off the linebacker. 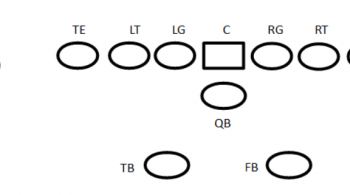 In this offensive line drill, you want to have two defenders and two blockers. 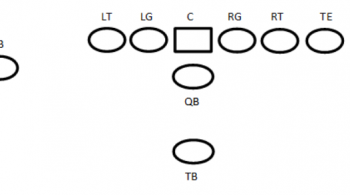 The two offensive players at the point of attack are going to focus on knocking one defensive player back. And then at a certain point, one of the two players will come off of the linebacker… but not until we get movement back off of the football. The post man will be on the defensive players’ shoulder blocking the inside number. Both players will work together, with the drive man stepping, getting square hip to hip with the post man, and blocking the outside number. The defensive player will resist, and then move straight back. 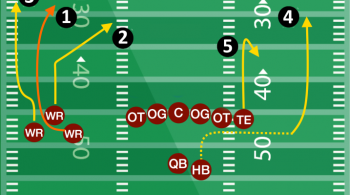 The second defensive player will scrape straight across, and at this point, one of the offensive players has to come off and run off tackle to the hole. During this drill, the post man and the drive man are still responsible for anyone running through the gap. It’s very important that your offensive lineman always know where the ball is going, so they can adjust and do what they need to do to execute the block. Double Team at the point of attack (to the left) is the same formation and steps, just to the other side with roles reversed. For more great offensive line drills, plus tips, techniques and a lot more, be sure to Become a Fan on Facebook! You can also Follow Me on Twitter and Hangout with Us on Google+!